البرمجيات يحوي منسق نصوص ومصمم بطاقات وبرنامج لعمل الاحصائيات مثل الاكسل وبرنامج لعمل عروض مثل الباوربوينت والكثيرة. حزمه الاوفيس المكتبيه من شركه اشامبو العملاقه وهو بديل ميكروسوفت اوفيس وبه كل مميزات الاوفيس يتيح لك انشاء المستندات وجداول البيانات والعروض التقديمية بشكل أسرع من أي وقت مضى. Ashampoo Office Pro We all know alternatives to Microsoft Office but do you know a low-priced Office that is fully compatible with both the latest and classic Microsoft formats? An office without compromise and no learning curve? 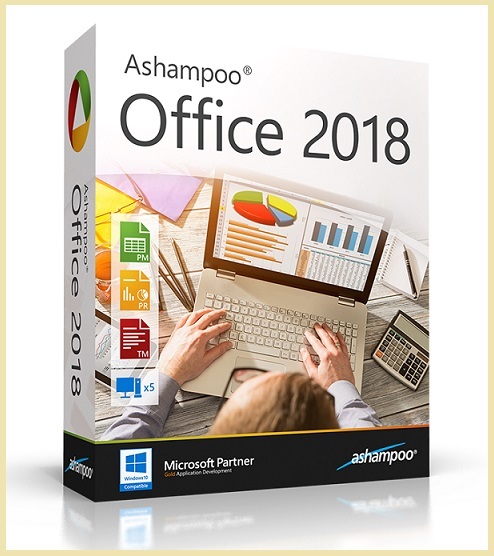 Ashampoo Office 2018 is the fastest way to create documents, spreadsheets and presentations with all the comfort and features you'd expect from a full-fledged office suite. It's power meets compactness in the ultimate Office suite!